My charmingly laidback home state of Odisha has been, of late, become witness to flurried activity. Hardly has the alarmingly passionate debate (euphemism for trading of insults) over the origins of the roshogolla with our worthy Bengali neighbours cooled down, and we are stuck with the acute housing problems of our Lord Jagannath. There you go! Housing woes affect the divine too! Everything about us Oriyas is connected to Lord Jagannath. The Lord is a highly humanized deity. He brushes his teeth, takes baths, changes his clothes umpteen times. He falls ill after an extended bath on his birthday, celebrated as Snana Yatra, goes visiting his aunt Queen Gundicha along with his siblings, loves jewellery, enjoys gourmet meals (56 varieties of food make up a single feast) . He really lives it up in style! We Oriyas have a very special bonding with Lord Jagannath. We believe that he is one of us... someone in our gang. So much so that we take the liberty of lying in his name too! I keep telling non-Oriyas that they should be a little sceptical if an Oriya swears by the lord! For you see, we believe that Lord Jagannath will bail us out of ALL tricky situations, even if we have been a trifle naughty. Yeah, he is that cool... our Jaga Kaliya, as we affectionately call him. Jagamohan, a sprawling prayer hall facing the sanctum sanctorum of the Jagannath Temple, might collapse anytime... That spells disaster. Reportedly, the structural condition of Jagamohan, a sprawling prayer hall facing the sanctum sanctorum of the Jagannath Temple is highly unsafe and the structure might collapse anytime. That spells disaster of epic proportions and thus too many "cooks" are busy cooking a broth to save the situation (and themselves). The chairman of a technical core committee set up by the Archaeological Survey of India (ASI) for supervision of the conservation work at the temple resigned in a huff, allegedly because the ASI rejected an estimation and repair plan for the Jagamohan hall. The rather poor upkeep of the magnificent temple has become a highly politicized issue, with the ruling BJD and opposition Congress and BJP baying for the ASI's blood. Apparently, the Chief Minister and the Prime Minister have exchanged letters. High-level meetings and debates about the "right thing to do" are on. The rather poor upkeep of the magnificent temple has become a highly politicized issue, with the ruling BJD and opposition Congress and BJP baying for the ASI's blood. "How many twenty-second-century bureaucrats did it take to change a light panel? We'll have a sub-committee meeting and get back to you with an estimate." 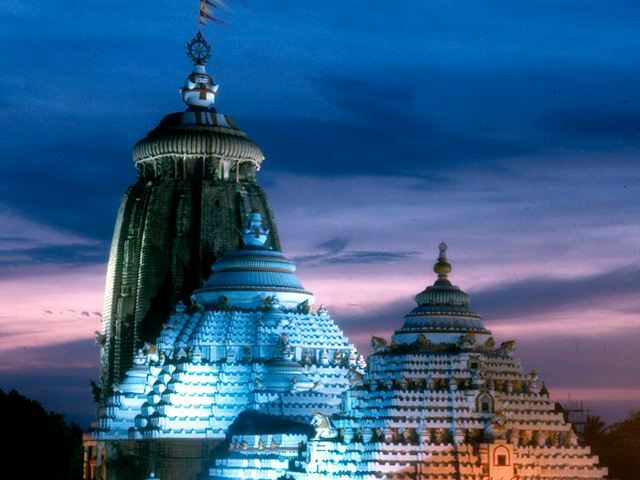 As an Oriya, a devout bhakt of Lord Jagannath and also an individual who since childhood has marvelled at the magnificence of the architecture of the temple and been thrilled by the many legends attached to it, I also wait very anxiously for everything to become alright once again. Do I sound terrifyingly religious or parochial? Well, I would echo Abraham Lincoln's words, "When I do good, I feel good. When I do bad, I feel bad. That's my religion." Lord Jagannath must also be a tad worried about his house repairs. Hopefully, he won't have to call his chief architect/engineer, Lord Vishwakarma, to bail him out. "I believe in God, but not as one thing, not as an old man in the sky. I believe that what people call God is something in all of us. I believe that what Jesus and Mohammed and Buddha and all the rest said was right. It's just that the translations have gone wrong." Meanwhile, I think my highly human Lord Jagannath must also be a tad worried about his house repairs. Hopefully, he won't have to call his chief architect/engineer, Lord Vishwakarma, to bail him out. What with the poor mobile connectivity there... tsk tsk.